Can I purchase your items from your premises directly ? Will your electrical product work in my country? How do I find out more technical information on your items? How can I follow your products? I placed the order ? YES, offcourse. Please call +61 411561318 to arrange suitable time. Unfortunately, as Smartstore strives to provide its customers with the lowest prices possible, we are essentially an online store and do not have the capabilities to demonstrate products. All of our products are pre-packaged from our suppliers straight to our warehouse, ready to be shipped to you! We will continue to provide highly detailed descriptions, photos and information on all of the items we sell and if you can't find what you're looking for there, just contact our fantastic customer service team who will happily help find the information you're looking for! We are an Australian company selling products that were made for the Australian market. In Australia products are made to be used on 220V-240V. All our electrical products off course will have an australian type power plug. If you are an oversees buyer, Please do you own research prior to bidding. In the USA appliances run on 110V, Thus if purchasing one of our appliances, you will need to get a local converter that may be costly. Please do your own research in regards to your country of origin, as we will not accept products back for reasons of incompatibility. smart store offers to you name brand equipment at unbelievable savings without compromising on quality. Why buy new when you can get the same equipment in factory refurbished for up to 50% savings without experiencing any difference? Manufacturers are extremely confident with their refurbished products and offer manufacturer warranties on all items. All our factory refurbished products are in perfect working order. It may have a cosmetic blemish or a scuffmark incurred during transit. It may have been a showroom display model, a demonstration model or a reworked product. All smart store products are directly from the manufacturers and come with a full manufacturers warranty. • Items where the box or casing was damaged in shipment which are returned to the manufacturer. • The item was returned to the manufacturer because of a slight defect. The part that was defective was replaced by the manufacturer, tested and then repackaged just like new. • The item was returned because of a minor cosmetic blemish on the casing that was corrected. refurbished. These units are inspected, tested and repackaged. • The box was simply opened. That’s it! • Customer took advantage of the 30 Day Money Back policy. • Brand new overstocked items are also labeled factory refurbished. It is impossible for us to know the history of each item, but for whatever reason the unit gets labeled factory refurbished it is inspected & serviced by the manufacturer then tested and repackaged to meet original product specifications. Again, they are fully tested and certified by factory and just like brand new! If you couldn't afford that expensive item till now you can with a factory refurbished. And still get the same performance. Statistics show that Factory Return (Renewed) products actually have a much lower return rate than new products due to the fact that every single Factory Return (Renewed) product is inspected and tested and typically new products are only randomly tested during the manufacturing process. At smart store we truly believe that the Factory Return (Renewed) products we carry represent exceptional value to you the customer. We have sold many of these and people are very happy. 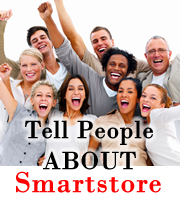 You can bookmark our website at the following address: http://www.smartstore.com.au. You can also subscribe to our newsletter and be updated with the latest innovative products, special offers and more. We will endeavour to regularly source RED HOT bargains and make them available on smart store.com.au. These will be limited in stock and will be changed on a very regular basis. You can use the SEARCH field to search for any particular item of interest. We apologise for the incorrect product description provided when you made your purchase , please contact us with your order number. We will resolve this mistake as soon as possible. Sell on the Internet only which eliminates expensive retail costs. Due to stock turnover and nature of business, our products are sold on a first order - first sold basis. You may place an order for the item you wish to purchase first and make your payment within the next 3 days.